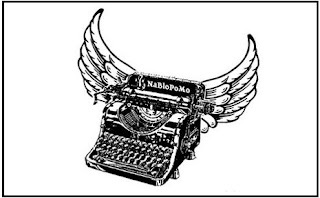 Sunpenny Publishing Group: We're participating in NaBloPoMo Month! "What on earth is that?" you might think, if you're new to the online writing and blogging community. Or, if you're in the know, you may be thinking of the frenzy that November's challenge brings you every year. 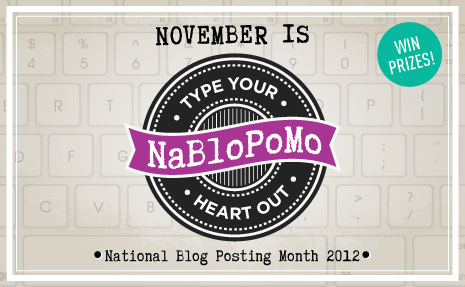 NaBloPoMo is an abbreviation for National Blog Posting Month and we're taking part in this November's blogging party with the theme of 'Blogging for Blogging's Sake'. The challenge is to post every day, or more than usual, for the month, with the apt motto, 'Type Your Heart Out!' and our aim is to publish a post at least three times a week. Although we're starting a little late into November, we think it's great that it gives us more chance to talk about books! The home of NaBloPoMo is over at Blog Her where you can find out more information about the challenge, writing prompts and a blog roll of who's participating. The deadline for signing up to the blog roll was the 5th of November but you can still stretch yourself to writing more on your blog this month or sign up for another similar event in the coming year if you'd like to participate. We hope you enjoy our posts this month!